As you all may know, I have a new puppy; Charlie. Charlie is the cutest thing you’ve ever seen, what’s not are the spots. Oh how I forgot how much work having a puppy is. What was the very first essential purchase I made: Training Pads. I promise I’ll be reviewing many different brands of training pads, but this time, I simply went with the most economical –Simple Solution Economy Puppy Training Pads, 100 Count. 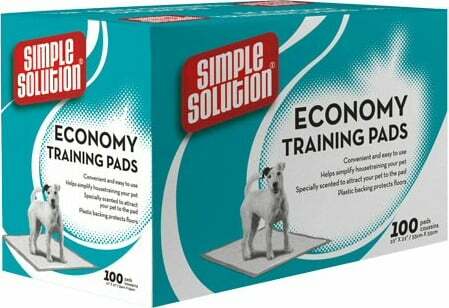 Simple Solution Economy Puppy Training Pads, 100 Count was my choice simply on the fact that I had already spent over $300 on my essentials puppy package. I recommend you go for the biggest box you possibly can. The big boxes are most cost efficient and trust me, you’ll use them. Besides that they work. My 10 week old puppy took no time at all learning that these training pads are the “THE place to do business”. Aside from them, they are made in the USA by the Brampton Company. That is always a plus in my book. My one negative, they are not biodegradable. There are versions of biodegradable training pads. In fact, the Brampton Company makes some too and for both cats and dogs. Regardless theSimple Solution Economy Puppy Training Pads, 100 Count is available at both PETCO and Petsmart. If you know a friend with a puppy, send them a box as a puppy warming gift. They’ll be sure to appreciate the gesture. For the best price, go to Amazon.com.